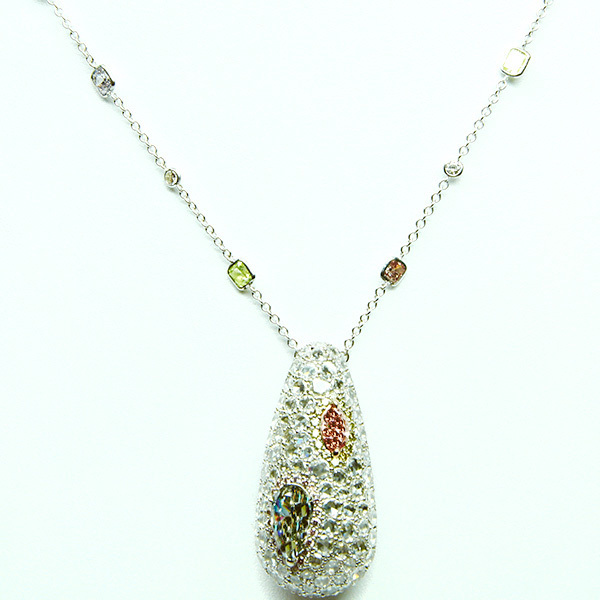 1=2.00ct Pear Fancy Grayish Yellowish Green VVS & 1=0.53ct Marquise Fancy Intense Orangy Pink Diamond Pendant. 1=2.00ct Pear Fancy Grayish Yellowish Green VVS & 1=0.53ct Marquise Fancy Intense Orangy Pink Diamond Pendant. Set with (92)=4.62cts Rose Cut White Diamonds, (21)=0.25cts Pink Melee Diamonds and (14)=0.21cts Green Melee Diamonds, Made in 18KW & Rose Gold 10.22gr.